The Syrian regime has launched an offensive in the northern province of Aleppo. This operation follows shortly after the regime victory at al-Qusayr in Homs province, where Hezbollah forces and National Defense Forces played key roles. Along with key regime units, these forces have redeployed to Aleppo in support of this operation, indicating its strategic significance to Assad. A regime victory at Minnakh Airbase, north of Aleppo city, would secure regime resupply to forces clearing the countryside north of Aleppo city, threatening the opposition presence in the province and isolating opposition strongholds in Idlib and al Raqqa. On the heels of its success in al-Qusayr, the Syrian government launched a new offensive against rebel-held areas in Aleppo province, marked by the deployment of thousands of Lebanese Hezbollah militants on June 2. Focusing on strategic targets in northern Aleppo province, government forces have reinforced their defenses at Minnakh Airbase, and started to deploy on a large scale in the surrounding countryside. The swift advance toward Aleppo comes in lieu of regime force consolidation in positions surrounding al-Qusayr in Homs province, suggesting that the Syrian government believes its potential for success against a reeling rebel force in the contested environs of Aleppo city outweighs the dangers of losing some of the ground recently gained in al-Qusayr. Syrian President Bashar al-Assad likely perceives the current momentum shift in his favor as an opportunity to deal a lethal blow to the opposition. Furthermore, he likely seeks to defeat the armed opposition militarily before they can be armed by Western powers. Given that rebel positions in Aleppo province are not operationally oriented to counter a regime ground campaign, and that the Syrian Military has been revitalized by Hezbollah’s overt involvement in the conflict, it is not beyond reason for the Syrian government to think that a primary offensive could lead to results similar to those seen in al-Qusayr. However, despite its impressive military gains in recent weeks, the Syrian government does not have the forces required to simultaneously retake all rebel-held areas of the country, and there are limits to the amount of reinforcements that Hezbollah can provide. This suggests not only that the regime will struggle to achieve a level of success in Aleppo, but also that it will risk losing territory gained in recent offensives. The regime faces the risk that its campaign may culminate before it reaches its operational and strategic objectives. The Syrian government is employing a familiar strategy in the potential battle for northern Aleppo, called Operation Northern Storm. This strategy proved successful in the battles for Wadi al-Deif and Maarat al-Numan leading up to its victory in al-Qusayr. At the Wadi al-Deif Airbase, next to the city of Maarat al-Numan in Idlib province, regime military forces broke a significant rebel siege and were able to re-establish an important strategic presence before attempting to retake the rebel-controlled town of Maarat al-Numan. Once in control of Maarat al-Numan, government forces were then able to re-open critical ground supply lines which allowed for the redirection of airpower and an expansion of its air campaign over Homs province prior to its advance on al-Qusayr. A similar operation is now underway at Minnakh Airbase, where government reinforcements have been flown to help break through the rebel siege, and clearance operations are occurring in the villages located along the highway leading into Minnakh. If the regime is able to break the siege at Minnakh, it will be able to push south to consolidate its control of the highway leading into Aleppo city, thereby cutting off an important supply line for the opposition. This will set the stage for a potential siege of Aleppo city as government troops are able to advance on the city from both the south and the north. Another regime practice that it has executed elsewhere centers on preparatory operations to clear the towns and villages surrounding a principal objective. In al-Qusayr, government troops led by Hezbollah guerilla forces first cleared adjacent towns, such as Shamsin and Shinsar. Once in control of these towns, the government proceeded to conduct preparatory bombardment of al-Qusayr before sending in Hezbollah irregular forces, followed by Syrian government infantry troops. This strategy included driving rebel forces inward to compress their ranks and then isolating them to prevent rebel reinforcement or resupply. The combination of these attacks proved insurmountable, and the rebels were forced to retreat out of al-Qusayr. The early stages of the government’s offensive in Aleppo share these same characteristics, as government forces are focusing on control of the airbases and supply lines while simultaneously clearing surrounding towns, particularly Nebul and Zahra. Both towns are predominantly Shi‘i and have been heavily contested between opposition and government forces, much like the villages to the southwest of al-Qusayr. Neither side has demonstrated a clear advantage as of yet, making the results of these specific clashes highly pertinent to the upcoming offensive against Aleppo city. The towns of Nebul and Zahra are significant for three reasons. First, if the towns were to come under complete government control, they could serve as important staging grounds for attacks against Aleppo city. The regime could consolidate its positions around Aleppo before launching an intensive ground campaign. This was a successful approach in the siege of al-Qusayr, as the regime cleared and gained control of towns neighboring al-Qusayr leading up to the siege, providing them a base of support from which to launch attacks. 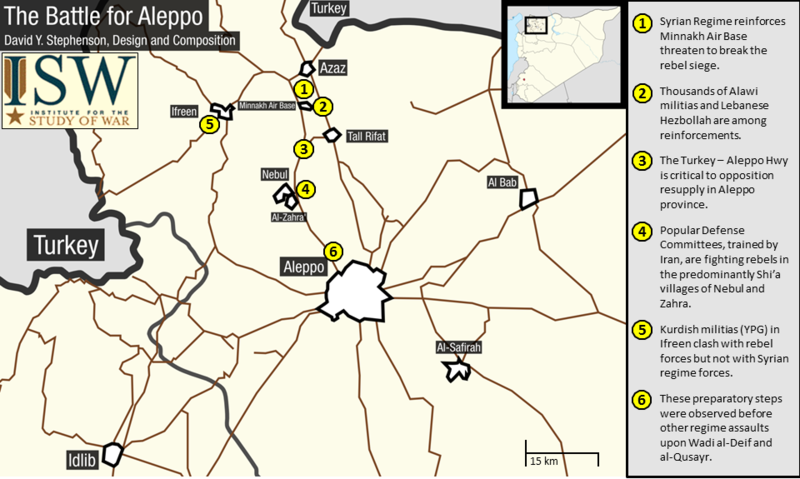 Second, the towns are strategically located along the highway between Aleppo and Minnakh Airbase that leads to Turkey. This highway has been used as an important resupply route for rebels fighting in Aleppo city. If government forces took control of the surrounding towns, they would be able to isolate and besiege rebel forces operating in Aleppo city. Again, similar tactics were used by the government in the battles for al-Qusayr and Wadi al-Deif, with rebels losing key highway checkpoints in the days leading up to their retreat. Third, government control of the towns would help solidify its control of Minnakh Airbase, from which the Syrian Air Force can launch air raids against rebel positions both within Aleppo city and in the surrounding countryside. Nebul and Zahra have been defended for the last few months by Popular Defense Committees, militia units composed of minorities who have armed themselves to protect their communities against opposition fighters. These committees are directly supported by the government and Iran. Though these predominantly Shi‘a Popular Defense Committees operating in the area had initially agreed to a truce with rebel forces, the ceasefire failed on April 3rd and clashes have occurred regularly since that time. Despite additional ceasefires attempts, the regime has largely been able to disrupt attempts at mediation between the two communities. To this end, the Popular Defense Committees have served as an important irregular force on behalf the Syrian government, and thus far they have largely cooperated with the regime on its recent offensive. In addition to the local Popular Defense Committees, thousands of Alawites belonging to pro-government paramilitary troops are being sent to Aleppo. These Alawi fighters function similarly to the Popular Defense Committees, forming militia-like units within the government’s newly created National Defense Force (NDF). The Syrian government is also relying extensively on support from Hezbollah forces for operations in Aleppo. According to rebels from Aleppo’s Tawhid Brigade, Hezbollah fighters are amassing around the two strategic towns of Anadan and Harithan that could be used to launch the government’s campaign to retake much of the rebel-held areas in Aleppo. One Hezbollah commander acknowledged that there were at least 2,000 Hezbollah fighters in Aleppo province in preparation for an attack on Aleppo city, which he claimed has already begun on small scale. While the combined effects of these reinforcements have sustained the government’s campaign so far, there are growing signs of strain, particularly for the Hezbollah units involved which have already suffered more casualties than expected and have been forced to change their rotation patterns. Hezbollah also faces growing domestic pressure over their role in Syria. Whether they will be able to sustain such a high-level of involvement in Syria is debatable in light of their political position and resource limitations. Thus, it could be argued that the government has pushed on the offensive in Aleppo rather than consolidating in Homs because they recognize that there is a certain time limit to the all-out support it is receiving from Hezbollah. Another prominent factor in the unfolding situation has been the role of local Kurdish groups around Aleppo. Relations have been tense between rebel groups and local Kurdish groups that maintain control of Sheikh Maqsoud, a neighborhood in northern Aleppo. Additionally, there has been a notable increase in the amount of violence between the Kurdish Popular Protection Units (YPG) and rebel forces northwest of Aleppo, in the Ifreen area. Reports from Syrian Observatory for Human Rights (SOHR) show significant YPG-Rebel clashes beginning on June 6th, the day after al-Qusayr fell under government control. Clashes have continued throughout the Ifreen area, as YPG forces have taken numerous villages along the main ground line of communication leading from Aleppo city into Turkey, and have also seized a number of connecting roads. The YPG appears to be defending and consolidating its territory. At the same time, YPG clashes with regime forces have been noticeably absent. In fact, regime and YPG agendas appear to be aligning with Kurdish elements reportedly cooperating with regime forces to protect their territory and evict the rebels from the area. YPG forces have been largely successful in seizing temporarily rebel-held territory, and they serve as another obstacle to opposition control along the Turkey-Aleppo line of communication. Overall, tense relations between the Arab and Kurdish armed groups have proven a considerable weakness for the opposition, and one that the regime will look to exploit further as it advances on Aleppo city. The recent surge in activity in strategic locations around Aleppo has shown the regime’s willingness to shift its attention away from its recent victory in al-Qusayr, and instead to focus on a battle for northern Aleppo. The rebels’ main supply line from Turkey flows into Aleppo, and then extends throughout the rest of northern and central Syria. The loss of the Turkey-Aleppo supply line would likely cripple rebel ability to contest areas throughout the Aleppo and Idlib provinces and further south into central Syria. It would also serve to further fragment the opposition movement, as rebel groups would no longer control a geographically linked territory from the east to the west, across Raqqa, Aleppo, and Idlib provinces. With rebel groups bogged down in Aleppo city and others isolated in positions to the west in Idlib province and to the east in pocketed strongholds in Raqqa and Deir Ez-Zour provinces, it is highly doubtful that opposition forces would be able to mount any offensive capabilities against the government. While fighting would continue, rebels would likely be forced to revert back to guerrilla tactics rather than attempting to hold territory. Although the recent gains made by the Syrian government are likely to diminish overtime, at the present time, momentum is clearly in the government’s favor. As the Syrian opposition faces new incursions by pro-government forces, including Hezbollah and other Iranian-sponsored militants, discussions to aid the opposition have taken on added urgency. Given the backing of Assad’s allies, it is unlikely that the opposition will be able to defend Aleppo without external support. On June 12, Free Syrian Army leader General Salim Idriss requested lethal support to the opposition in a pressing letter to the White House, stating that they “cannot hold on to Aleppo without these weapons.” As the Obama Administration has declared that the Assad regime has crossed a "red line" in the usage of chemical weapons in Syria, a decision has been taken to begin supplying opposition groups with lethal aid in the form of small arms and ammunition, as well as possibly anti-tank weaponry. A decision to supply rebels with anti-aircraft weapons has so far been declined. Whether this provision of aid will be sufficient to slow or reverse regime advances remains to be seen. Loveday Morris, “In Syria, Hezbollah forces appear ready to attack rebels in city of Aleppo,” Washington Post, June 2, 2013. Alexander Besant, “Operation Northern Storm: Syrian army plans assault on Aleppo,” Global Post, June 10, 2013. Jonathan Dupree, “Syria Update: Regime Breaks Siege at Wadi al-Deif,” Backgrounder, Institute for the Study of War, April 18, 2013. Joseph Holliday, “The Assad Regime: from Counterinsurgency to Civil War,” Institute for the Study of War, March 2013. Syrian Observatory for Human Rights Facebook Page, April 3, 2013, https://www.facebook.com/syriaohr. Julian Barnes and Adam Entous, “Rebels plead for weapons in face of Syrian onslaught,” Wall Street Journal, June 12, 2013. Morris, “For Lebanon’s Sunnis, growing rage at Hezbollah over role in Syria,” Washington Post, June 12, 2013. Syrian Observatory for Human Rights, June 6-12, 2013. Syrian Observatory for Human Rights, June 6, 2013. Mark Mazzetti, Michael R. Gordon, and Mark Landler, “U.S. is Said to Plan to Send Weapons to Syrian Rebels,” New York Times, June 13, 2013, http://www.nytimes.com/2013/06/14/world/middleeast/syria-chemical-weapons.html?hp.